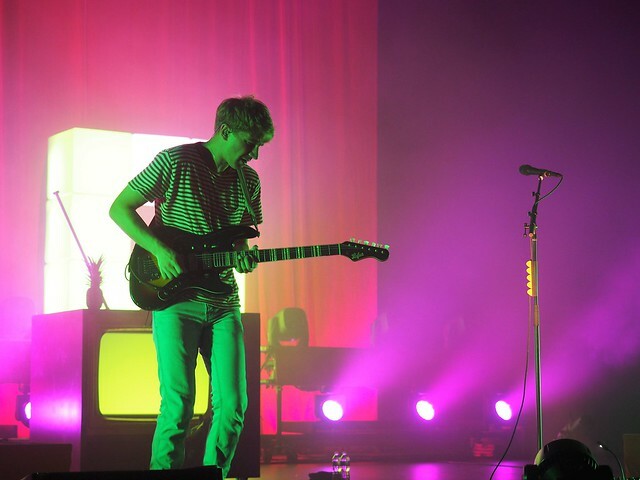 Glass Animals aka BFFs – Welcome back to Lou! First off, a little brag: How cool is it that we interviewed them on Do502 before their last Headliners show?!? It seems like forever ago, and my how the band has changed over the past few years. For the better. It feels like we have been there for each step of their growth to pretty major stardom, so we’re basically bffs…right, Glass Animals? I mean, they consistently sell out shows across the country and they are a huge draw on the festival scene. Their set at Bonnaroo was ginormous, btw. And in just the last couple of years, they have two successful albums under their belt. They seem to attract a certain type of fan. The young folks love ’em. Based on my internet creeping, I think they are our age? Yet, they draw lots of high school and college kids to their sets. Their upbeat, tropical vibey music is cool, fun and high. I mean, I get it, I really enjoy it myself. Iroquois Amphitheater was sold the eff out and everyone was loving it. It was hot as hell (that seems to be a trend at their shows in Louisville) but the sweaty crowd could care less. I would like to think that the Glass Animals boys love Louisville as much as we apparently love them. It is always a treat, nevertheless. Until next time, ya’ll.